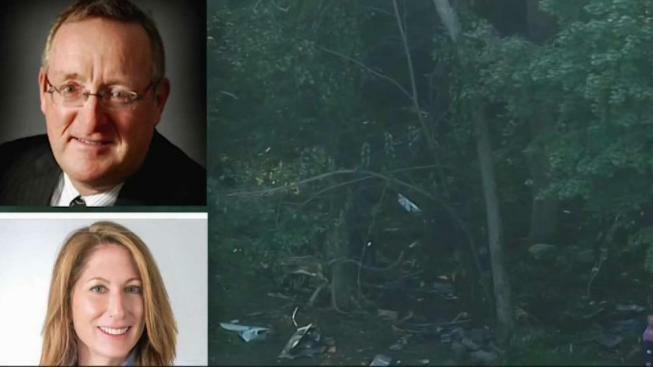 A couple from New York was killed following a small plane crash in Woburn, Massachusetts. The plane crashed into the woods behind a house on Minchin Drive around 11 a.m. Saturday. The victims were identified as 65-year-old Dr. Michael Graver and his 52-year-old wife, Jodi Cohen, of Manhasset. Investigators say the couple was headed to Massachusetts to meet up with their child when their plane went down less than seven miles from the airport and just minutes before its scheduled landing. Julianne Almeida heard something that didn't sound right seconds before the couple's single engine plane crashed. "You could hear something was wrong," she said. "It was definitely like in the movies when you hear it coming down." Moments later, Almeida says she "heard the boom." Almeida's husband Marc also heard the explosion. "The scene was pretty crazy how close everything was to the houses," he said. No one on the ground sustained any injuries, and no homes in the area were damaged. "There was stuff exploding, and there was debris all over the street," Almeida said. While Almeida has seen a lot in her 15 years as an emergency room nurse, she says nothing has shook her this badly. "Just yelling, 'can anybody hear me? Are you alive? Can you hear me?' Nobody was answering." Dr. Graver was flying at the time of the crash and was a "very experienced" pilot according to his family, District Attorney Marian Ryan said at a 3 p.m. press conference. The 2006 Columbia Aircraft LC41 departed from Republic Airport in Farmingdale, New York shortly around 9:33 a.m. and was scheduled to land at Hanscom Air Force Base in Bedford, Mass. just after 11 a.m., according to the Massachusetts Port Authority and the Federal Aviation Administration. Woburn police started receiving 911 calls regarding a plane crash around 11:03 a.m., according to DA Ryan. Dr. Graver was the chief of adult cardiac surgery at North Shore University Hospital, according to the Northwell Health public relations office. Cohen had been working for the past five years at Douglas Elliman Real Estate, where a senior executive manager of sales called her a "terrific class professional and a great woman." The 4-seat aircraft was co-owned by Dr. Graver and another man, who was not identified. The plane will be removed from the area over the next 48 hours. The investigation into the cause of the crash is open and ongoing.